The original bridge at Ynys is a narrow masonry arch structure located on a tight bend in the road. As the A496 is a main road and used by large wagons servicing the tip and recycling facilities just outside Harlech, the bridge has been prone to accidents and causing delays to traffic. The location had been identified as a site for improvement in the 1970s and fill material had been deposited on an indicative line at that time to create the new highway in the future. 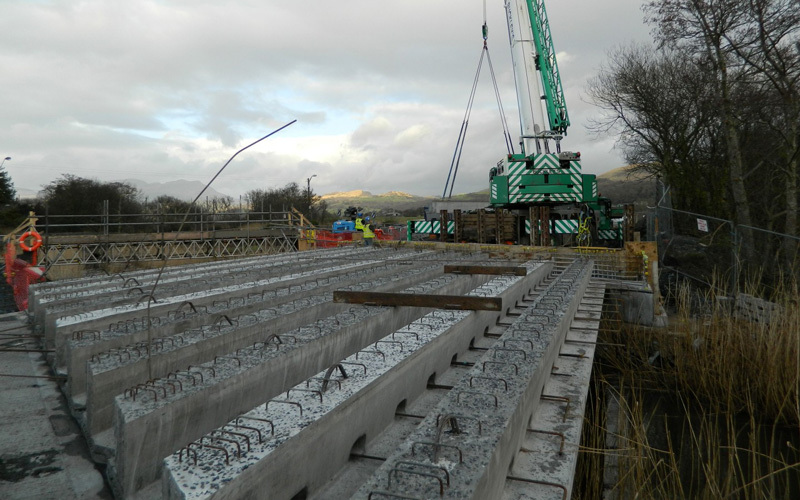 In September 2012 a scheme was requested to design and construct a new bridge and adjoining highway prior to Easter the following year (to be in place prior to cell capping operations at the tip). The line of the tipped material from the 1970s had been protected from environmental designation, however either side of the works area were protected sites of SSSI and SAC. Otters were known to be present along the river and the site contained a large amount of the invasive species, Japanese Knotweed. To achieve delivery of the works in the limited timescale a prioritised programme was needed to ensure the various permissions and consents were gained; this required prompt finalisation of the highway alignment and location of the bridge to apply for planning consent, with a flood risk assessment and appropriate environmental studies. The local community was informed of the proposed works by door-to-door visits to get their buy-in and so not delay approvals. 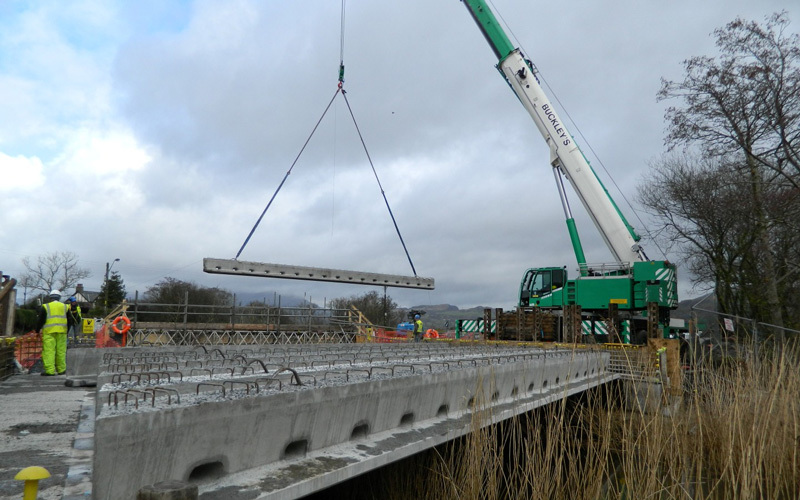 The main feature of the works is the new bridge; an integral pre-stressed concrete beam bridge was designed to Eurocodes, 12m square span – 15m skew span, with H-pile foundations approx. 8m deep through gravels and peat to rock head. 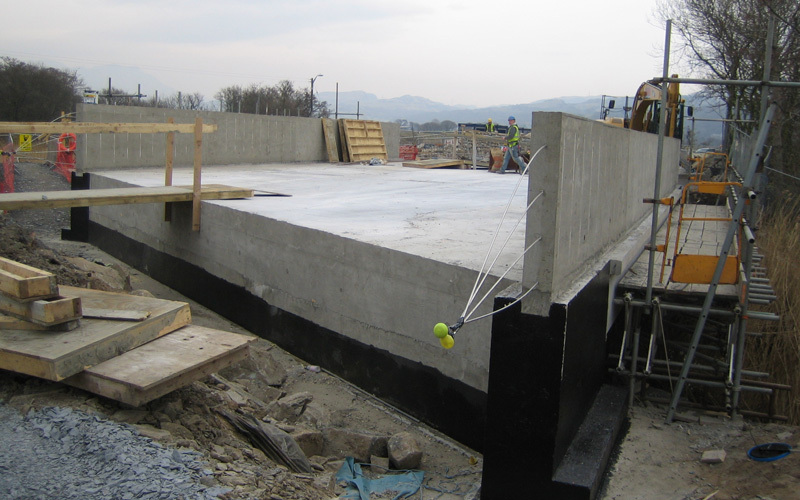 Due to the high skew, need to over-span the river banks to maintain a wildlife corridor and need for minimum depth of construction, the design of the precast beams pushed the use of a ‘T’-beam deck to the limits. In addition the bridge had to fit in to the original surroundings of stone buildings and the original bridge; to achieve this a masonry parapet and approach walls was used over the bridge and abutment wingwalls clad with stone. Works were procured through the contractors framework on an NEC Option B contract with the contractor, Jennings, being appointed at the beginning of Jan 2013 on a tendered price of £360,000. Knotweed removal and burial on site proved to be the most onerous task of the works with quantities of rhizome contaminated material increasing and accounting for a £15k increase in scheme costs. The new highway was opened at the end of March 2012, just prior to Easter, with positive comments from all involved and the local community. Having kept locals informed on the proposed works and progress there had been no complaints to the local councillor, something he found very pleasing!